Hearings and Interior statements signal a step back for tribes trying to acquire lands. During President Barack Obama’s eight-year tenure, tribal sovereignty, the power by which tribes govern themselves, was a prime concern. But under the Trump administration, that may change. There are several indicators of this shift, including proposed budget cuts to the Interior Department’s Bureau of Indian Affairs and the de-prioritization of major land initiatives. 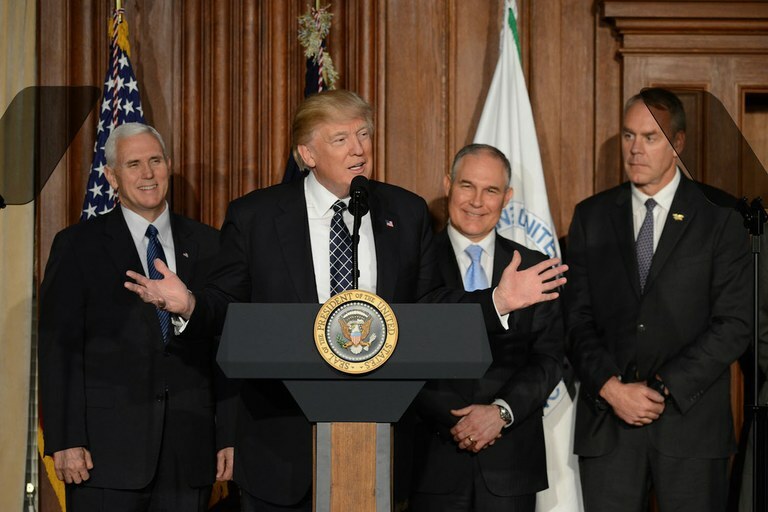 Within the first six months of President Donald Trump’s administration, the Department of Interior has renewed its interest of energy development and tribal land privatization. That differs starkly from Obama policies, which focused on both acquiring and consolidating land for tribal nations. One of the most ambitious efforts to that end, the Land Buy-Back Program, will not continue under Trump. The Land Buy-Back Program sought to end a process called fractionation, which continually splits land ownership among tribal descendants and makes the land difficult to use for development or agriculture. Using part of the $1.9 billion for tribes under the so-called Cobell settlement, some 2 million acres of land were returned to tribal governments under Obama. But with the majority of that money already spent to defray fractionation, the new direction at the Interior Department will not put additional funds towards the program, according to James Cason, the associate deputy secretary for the Bureau of Indian Affairs. The first six months of President Donald Trump's administration has shown a step back from tribal land initiatives. Further worrying tribal leaders are two recent hearings held by the House Committee on Natural Resources, over both the Cobell settlement and another land policy, called land-to-trust, which dictates the procurement of land by the Interior Department that is then held in trust for tribes by the federal government, effectively creating a new parcel of reservation land not subject to state or local taxes or jurisdiction. In a hearing on the Land Buy-Back Program in May, the House Subcommittee on Indian, Insular and Alaska Native Affairs questioned Cason on the efficacy of the program. Cason, who worked for the BIA under the George W. Bush administration, which fought hard against the Cobell Settlement, is now in charge of the buy-back program. Cason told the subcommittee the program was not working to reduce fractionation, and suggested the funds be distributed to fewer tribes, especially those with cheaper land in rural areas. While that approach might lessen the federal burden from fractionation, it won’t help tribes like the Agua Caliente Band of Cahuilla Indians, whose land prices are high due to its proximity to Palm Springs, California. Regardless of how Congress decides to spend the remaining money for land buy-backs, the Trump administration says it will not continue funding the program, meaning tribal land will continue to fractionate generation by generation, making consolidation harder. “Perhaps no administration was more aggressive than the Obama administration in acquiring land into trust,” says Gabe Galanda, a Seattle-based tribal law attorney and member of the Round Valley Indian Tribes of California. “Now we’re starting to see the Trump administration vigorously react to that.” The administration’s attitudes toward the buy-back program will be a “bellwether” on how it will also handle trust lands, Galanda says. Another bellwether revealed itself in a July hearing addressing trust lands. In that hearing, a subcommittee for tribal affairs examined whether the land-to-trust program was following the law. At issue is the Obama administration’s approach to land-to-trust. Under Obama, Interior followed the policy for tribes that were established after 1934, the year of the Indian Reorganization Act, which established the land-to-trust policy. That has drawn criticism from Obama’s opponents, who say the law was only meant to address pre-1934 tribes, not tribes that were federally recognized after that year. At the July hearing, Republican witnesses said the process as conducted under the Obama administration was causing hardships on towns near reservations. Fred Allyn III, the mayor of Ledyard, Connecticut, which encompasses the Mashantucket Pequot Reservation, called his town a “host community” that was losing tax revenue to the policy, as it ramped up law enforcement around the reservation. There was also discussion of the federal government “creating” tribes. 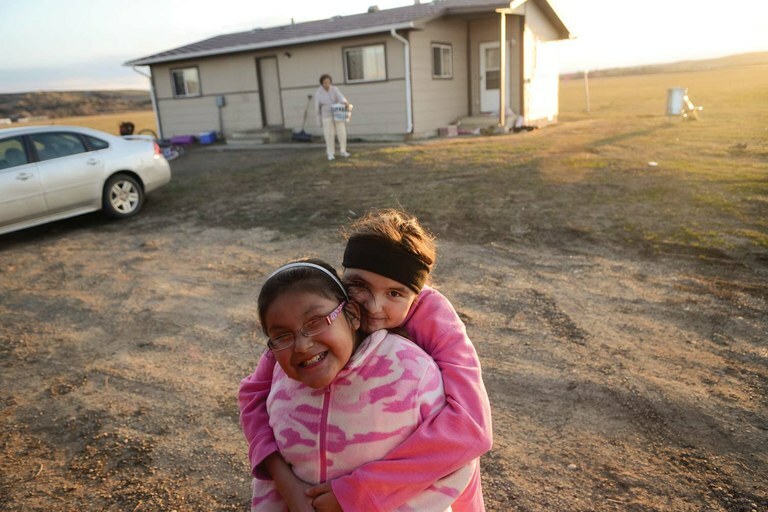 Tessa Plainfeather and Emily Moccasin embrace in front of their grandmother’s home on the Crow Reservation in Montana. The reservation is home to one of the 20 tribes with a lot of land that will still be included in the Land Buy-Back Program to reduce the impacts of fractionation. Taken together, the House hearings signal a broader shift in attitude toward tribes, their land and sovereignty issues. That’s already beginning to play out at the Department of the Interior, which last week proposed criteria that will make it more difficult for land to transfer into trust and reversed some Obama-era changes by widening the window for local and state governments to appeal transfers, from 30 days to six years. The hearings also resemble a federal attitude toward tribal lands half a century old. “All of these hearings in the last several months are basically a reinvigoration of what we used to call termination in the ’50’s and ’60’s,” says Matthew Fletcher, director of the Indigenous Law & Policy Center at Michigan State University. The hearings indicate a chipping away at the trust relationship between the U.S. and tribes, which means tribal lands could see less sovereign protection, which some experts see as the first step towards increased energy development. Further to that, Interior Secretary Ryan Zinke, who has in the past touted Trump’s “America First” approach to energy development, recently suggested that tribes should consider incorporating, a move that would help privatize tribal lands and reduce land held in trust by the federal government. At a National Tribal Energy Summit in May, Zinke said many tribes would prefer to incorporate and leave trust lands behind. His statement holds little traction with many tribes, however, because incorporating means losing tribal sovereignty, something Grijalva echoed in his House testimony.